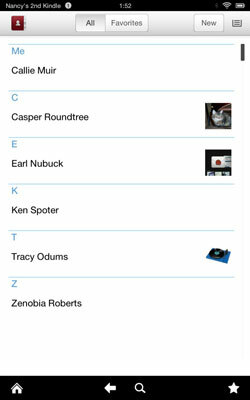 The Contacts app pre-installed on Kindle Fire HD is a basic but useful contact management tool. You can enter or import contact information, sort that information by several criteria, and use Contacts to address e-mails. You can find Contacts by tapping the Apps button on the Kindle Fire HD’s Home screen. Tap the Contacts app to display its main screen. 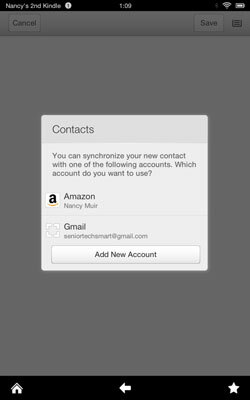 If you have associated an e-mail account with your Kindle Fire HD, you can import all contacts from that account instead of entering each contact’s information individually. After you have set up an associated e-mail account, when you first open Contacts and tap the New button, you get a message like that shown. Tap the account from which you want to import contacts. Your contacts are imported. If you want to create a new account, you can tap the Add New Account button at this point. If you want to add another account from within Contacts at a later time, tap the Menu button in the top-right corner of Contacts, tap Settings, and then tap Add Account. It’s data entry time! Importing contacts is a nice shortcut, but you still need to know how to manually enter contacts by adding their information in the New Contact form. Tap the Contact app on the Carousel or in the Apps library to open it and then tap the New button to create a new contact. The New Contact screen that appears contains fields including First Name, Last Name, Phone, and so on. Tap in a field and enter text. The onscreen keyboard appears when you tap in a field. 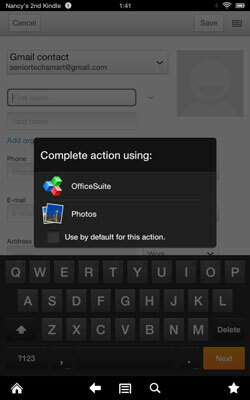 When you’re done entering text in one field, tap the Next button on the onscreen keyboard to go to the next field. 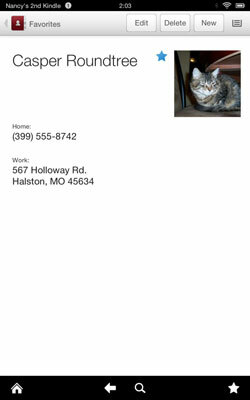 Be sure to scroll to the bottom and enter detailed address information. 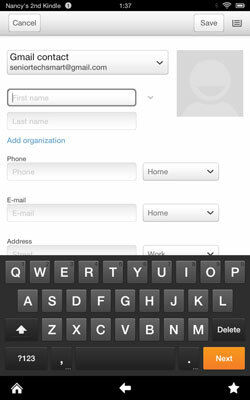 You can tap Add Another Field at the bottom of the form to choose additional information fields to include. Tap the Photo icon at the top of the form and then tap Add Photo to add a photo. Options appear for selecting photos. Tap a photo source such as Photos to open it, double-tap to open a photo album; then tap a photo to add it to the contact record. To edit the contact, tap the Edit button. To display all contacts, tap the All button. To delete the contact, tap the Delete button. You can use settings to control how your contacts are organized and even save contacts to a list of Favorites in the Contacts app. On the bar across the top of the Contacts list, tap the Menu button and then tap Settings. The E-Mail, Contacts, and Calendar settings appear. 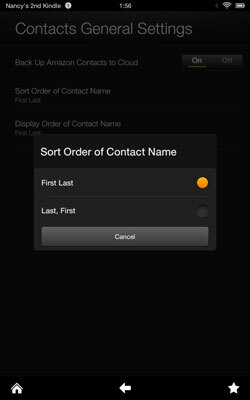 Tap Sort Order of Contact Name to display the options shown. Tap to sort by first name or last name. Tap Apps on the Kindle Fire HD’s Home screen and then tap Contacts. Tap the contact name you want to make a favorite. Tap the star that appears next to the contact’s name. The star turns blue, indicating this is a favorite. Tap the Back arrow in the Options bar to display all contacts. Tap the Favorites tab to display just contacts you’ve saved to Favorites.